Find romance and comfort at the Carriage House Inn on Junipero and 8th in Carmel by the Sea 93921. To book hotel reservations for that perfect room call Carmel Area Reservation Service at 831-372-5000. That perfect roomed will be booked for your comfort and ease! Welcomed to Carmel by the Sea is what you feel when you arrive to the deluxe Carriage House Inn located in the heart of the Ocean Ave shops! Especially since each room includes a free parking space in this coveted south of Ocean Ave location. Stroll to Carmel Plaza with the shops and art galleries all around you and eat in restaurants worthy of the highest praise. All Carriage House’s neatly decorated rooms have comfy king-size bed fireplaces, comforter, down pillows, flat screen TV, coffee maker and refrigerator. The bathrooms offer a single whirlpool and soaking tubs, all come with shower. Upstairs rooms have cathedral ceilings. Turn down service is provided in evening by request. Continental breakfast is brought to your room each morning. Complimentary in-room amenities are provided. 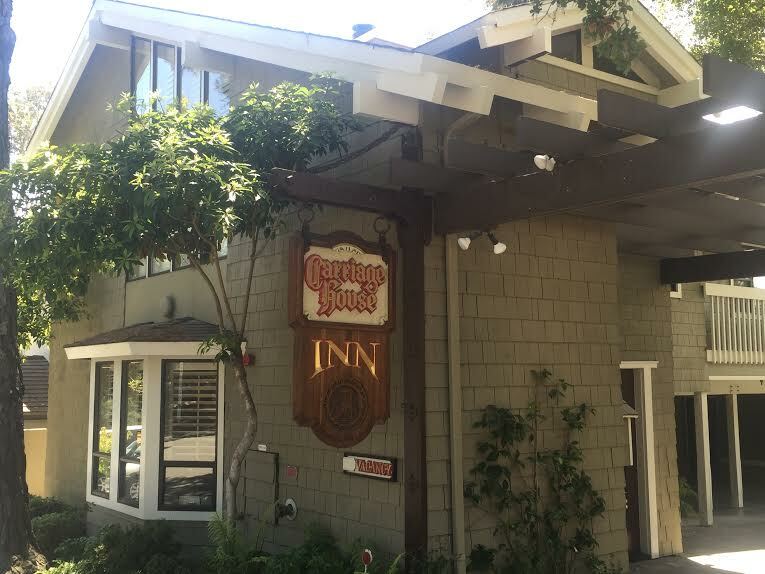 The best place to walk to Carmel Beach along Scenic Ave is Junipero and 8th Ave is here by the Carriage House Inn. Go take a look at the sunset. The inn is an easy walk of the Forest Theatre and Sunset Performing Arts Center making it very convenient for you.